Has anyone else noticed that SERP snippets are getting longer? Is the good old 160-character limit a thing of the past? It just may be. 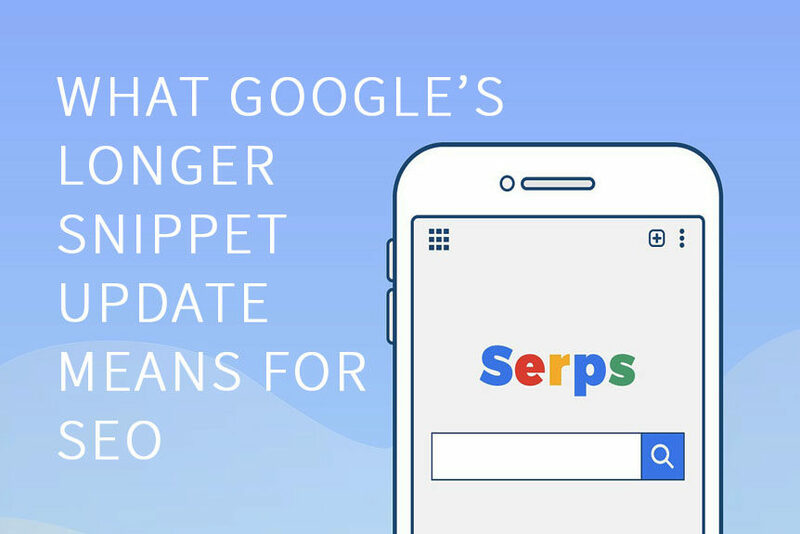 Google has officially announced that they’ve changed their guidelines regarding meta descriptions and extended the character limit on search engine results page snippets. Google has gone from recommending a maximum of approximately 160 characters, to publishing snippets which are on the brink of 400 characters. While many of us are still coming around to the idea, they actually began to roll out these changes in late November and early December of 2017. Here we’ve compiled some information to help you understand what these changes are, and what they mean for SEO. As most people involved in Search Engine Optimisation would know, Google has historically recommended a meta description length of around 160 characters. Rarely did Google ever display more than 160-180 characters of meta description in a SERP snippet. But as of the last few months, that has changed. Various studies following the changes have revealed that snippets have gone from 90% being 165 characters or less, to many showing 200, 300 and nearly 400 characters (https://www.sistrix.com/blog/google-permits-longer-snippet-texts/). So despite the fact that Google hasn’t outright told us what they recommend, it’s safe to say that snippets have indeed increased in length. And as search engine marketers, we usually do what Google wants us to do, even if that is following some pretty vague hints! A meta description is a website attribute which helps describe your page in a short snippet of text. This snippet of text can appear on search engine results pages along with a link to the referring page. Meta descriptions are typically editable and rewritable in your websites CMS. Something to keep in mind however, is that search engines have the power to omit it, edit it or pull it from other areas of your site. Meta descriptions can have a pretty significant impact on your SEO efforts, and serve valuable in search results. The meta description (or content snippet) below a website link on SERPs is essentially the “organic ad text” of our placement on said page. So, we need to treat them with the same importance as we do ad text. Your meta descriptions become a summary of what is on your page, and provide an additional opportunity for you to entice clicks and draw in visitors. A well written meta description can raise your CTR, even if your ranking stays stagnant. To put it simply, writing a meta description is like writing ad copy – there’s value in that copy as an opportunity to gain clicks and drive up interest. What Do These Changes Mean for SEO? While there are ways that extending the length of meta descriptions can benefit our CTR, like giving us more real-estate on SERPs, it could also mean that those numbers suffer a few hits as well. Moz provided a really great example of this point using ‘Net Neutrality’ as the example search. Say for example I don’t know what net neutrality is, so I perform basic Google search looking for the most basic explanation I can find. One of the first results is a page from Save the Internet , the result features an extended snippet which in full, provides a quick definition of what net neutrality is. The snippet length (276 characters) does not cut off mid sentence, does not end in ellipses and I do not need to read any more that what is right in front of me to answer my question. Therefore, I do not need to click on the website and read the content further. My question is answered and my curiosity is curbed. So, Save The Internet has just lost the click and therefore lost the visitor that they would have got if the description didn’t allow for so much information. Perhaps that’s something to keep in mind when writing those meta descriptions, make it informative, but not too informative. We still want to encourage people to visit our site after all! In the indirect fashion that they seem to love, Google is telling us something pretty clear with these changes. To put it simply, Google wants snippets to be more descriptive and more useful for those using the search engine. The meta description should be an informative, descriptive representation of what the related page is offering the visitor. Based on the countless research that has been carried out regarding these character limit changes, the general consensus is that we should be re-optimising our meta-descriptions, and aiming for the 300-character limit. Most studies are in agreement that the range of 230 – 320 is our new 160 – 180. If you’ve got a big site, it may be a little overwhelming to learn that you need to re-optimise your entire site – so make it a gradual effort. As part of your SEO efforts, you should already be carrying out regular analyses of the performance of your website and should have a good understanding of which pages are the most important. Start with the top pages, and continue to optimise by importance. If you are using plug-ins or other CMS settings which encourage you to stick to that 160 – 180 range, you may need to update them to recognise the new limits. Keep in mind, Google hasn’t stipulated any ‘rules’ as such regarding meta-descriptions, so we’d say it’s safe to carry out an experiment or two. Need a hand optimising the meta descriptions on your site to make the most of those extended snippets? Contact us. The Lauren Benedetti team are ready to get re-writing, fingers on keyboards!